The focus for Earth Day 2019 is “Protect Our Species”—especially those that are endangered or threatened. TVA helps care for such species in the Tennessee Valley in many ways. Here is one example: a rare, lovely orchid. TVA botanist Adam Dattilo carefully read the environmental report, expecting it to be like any other. It came from a team of TVA contractors whose routine transmission right-of-way assessments it is his job to oversee. But something in this particular report immediately jumped out at him. What the crew had found in the fall of 2015 was about 30 dried flower stalks. To the untrained eye they looked like ordinary dying flowers. Think two-week-old Valentine’s bouquet. But for Dattilo, the stalks were both puzzling and intriguing. 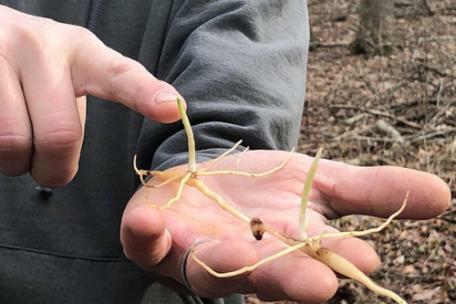 That fall, Dattilo and the crew studied these strange stalks, which had been found outside Spencer, Tennessee, about 100 miles southwest of Nashville. They compared the species to other known nearby plant populations. “This gave us a reasonable level of certainty that the species we found was uncommon indeed,” Dattilo said. What they’d found was the rare, white fringeless orchid — a.k.a. the monkey-face orchid. White fringeless orchids are primarily found in very small patches of less than 100 plants, mostly in undisturbed wetlands across six Southeastern states, with the Cumberland Plateau in Tennessee being their last stronghold. The species is listed as threatened under the Endangered Species Act. Dattilo’s assumptions were confimed in August, 2016, when he and a team of experts — university academics and state and federal wildlife personnel —finally saw the plants in full flower on the TVA land. That’s when they knew for sure what they had found. It was time to call in an expert — one who knows everything there is about the subject. There are only a few people on the planet who are rare orchid experts, but Dattilo happened to know one: Matt Richards, manager of conservation horticulture at the Atlanta Botanical Garden and a leading expert in the field. The team dug up the Spencer plants to move them to the Botanical Garden for safegarding. The 30 flowering stalks turned out to have more than a hundred plant roots underground. With this abundance of plants on hand, Richards had the opportunity to study different methods of growing the species in the lab. According to Richards, orchids are extremely difficult to grow from seed because they require fertilization from a separate fungus. Only about one in a million seeds actually fertilize, and it would take years to grow enough orchids to transplant them that way. To help speed up the growing process, Richards divided the root shoots of the harvested plants. By 2019, Richards’ lab collection grew to about 400 plants. While Richards was growing orchids, Dattilo needed to find a suitable location in Tennessee to replant them and someone to study them long-term. Dattilo received valuable help from Dr. Jennifer Boyd, associate professor of biology and environmental science at University of Tennessee Chattanooga and her protégé Savanna Wooten, graduate research assistant. “Who’s not up for a good rescue mission, especially when it comes to rare orchids?” said Boyd. Dattilo then assembled a team from the Botanical Gardens, U.S. Fish & Wildlife, the Tennessee Wildlife Recourses Agency and the Tennessee Department of Environmental Conservation. Out of thousands of square miles on the Cumberland Plateau, three sites were identified for transplantation. Dattilo, along with state and federal biologists, scouted each site to select the best home for Richards’ orchids. The team agreed on a secret spot, about the size of a basketball court, within the Bridgestone-Firestone Centennial Wilderness. Cages of PVC pipe and chicken wire were assembled for some plants to keep deer away. Other cages have small openings to see if other small animals, such as rabbits, affect the plants. The rest of the plants have been left open to grow naturally and fend for themselves. In March, 2019, Dattilo and the team planted 480 orchids in their new home. The team will monitor the site and collect data throughout the coming months. Dattilo doesn’t think of the team as superheroes, but when it comes to conservation, they really are just that. Without an array of players bringing their specialized skills to the table, the reintroduction of these rare orchids would not have been possible. The team eagerly hopes to see the orchids bloom this coming August. Boyd and Wooten hope the ongoing collaboration and the orchid’s new home will give them plenty of data to study for years to come in order to save this beautiful rare flower.